ACT, The American Conservatory Theatre, is presenting George Bernard Shaw's Major Barbara. It is a wonderful production, and well worth seeing. Unfortunately, there isn't much time left, but there are still a few dates before the play closes. Major Barbara, the title character, is a young woman from a wealthy family who has set money and her position in society aside, to help the poor. As the play opens, she holds an elevated rank in The Salvation Army. 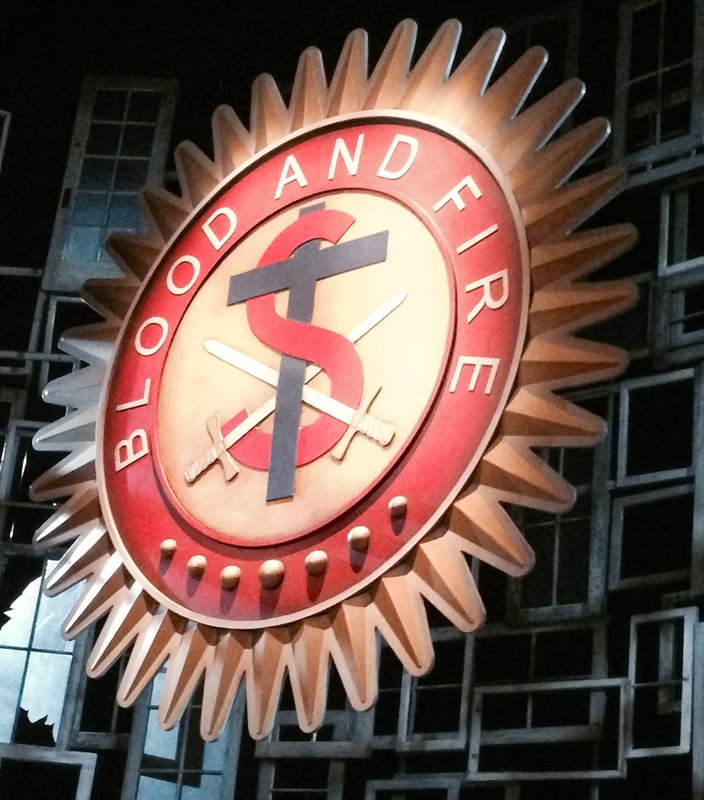 One thing the play does is to make the viewer want to know a bit more about The Salvation Army, whose badge proclaiming "Blood And Fire" dominates the stage presentation. You cannot have power for good without having power for evil too. Even mother's milk nourishes murderers as well as heroes. This power which only tears men's bodies to pieces has never been so horribly abused as the intellectual power, the imaginative power, the poetic, religious power that can enslave men's souls. As a teacher of Greek I gave the intellectual man weapons against the common man. I now want to give the common man weapons against the intellectual man. I love the common people. I want to arm them against the lawyer, the doctor, the priest, the literary man, the professor, the artist, and the politician, who, once in authority, are the most dangerous, disastrous, and tyrannical of all the fools, rascals, and impostors. I want a democratic power strong enough to force the intellectual oligarchy to use its genius for the general good or else perish. Adolphus Cusins, the character who speaks these lines, is Major Barbara's beaux. He has joined The Salvation Army not out of any sincere religious motivation but in order, as he ultimately confesses, to get close to Major Barbara. Major Barbara's father, Undershaft, is the owner of a massive munitions-making company, and he corrupts both The Salvation Army and Cusins. As the play concludes, Cusins makes a commitment to run the company's bomb factory under Undershaft's direction. The lines about politicians almost got a standing ovation. They seemed to resonate with the audience. Considered objectively, though, it was the capitalist business owner who is ultimately revealed as having the real power in society. Money rules politics, as he confidently proclaimed. If neither "politicians" nor businessmen are the models - and "spiritual reform" can't be relied upon (and that seems to be what Shaw is suggesting), there is all the more reason for building a "democratic power strong enough to force the intellectual oligarchy to use its genius for the general good." I usually phrase that: "We aren't going to have self-government if we aren't willing to get involved ourselves."